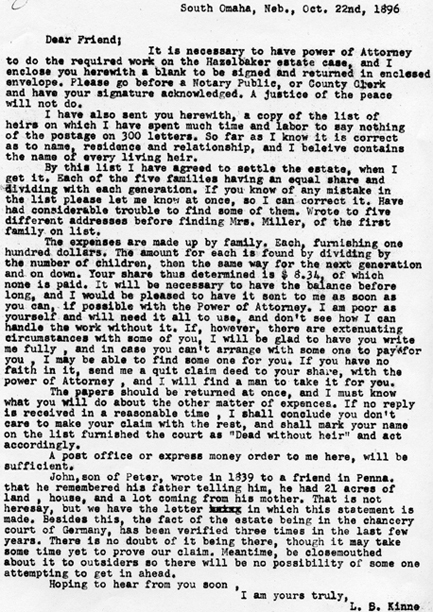 Approximately 1895-1898, many Hazelbakers, living all over the U.S. and Canada received a letter from a man named L.B. Kinne, along with “A Biographical Sketch of Peter Hazelbaker” (Fig. 1, referred to here as the Sketch) and 3 additional pages entitled “List of Heirs” (Figs. 2-4). During my many years of doing Hazelbaker genealogy research, I have come across these documents several times, but rarely, only twice in fact, have I been privileged to see the accompanying letter (Fig. 5). The letter basically stated that there was an inheritance awaiting the Hazelbakers over in Germany and that if they would send Mr. Kinne a certain amount of money along with their “Power of Attorney,” that he would do all that was necessary to recover that inheritance. I don’t know how many people actually sent him money, but I do know that the Sketch and List of Heirs was kept by many of the Hazelbakers who received it, and many handed it down to their descendants. I first saw the Sketch and List in the 1970’s. My dad… and my hero…Arnold Hazelbaker (1908-2001) received a copy of them from one of his cousins in Adams County, Ohio. The Sketch is very interesting, however none of the information cited resources, therefore I could not assume that all information was accurate. As I continued to do research, I found, as have so many other Hazelbaker researchers, very similarly worded information about Peter in more than one source, i.e., The Old and New Monongahela (Dr. John S. VanVoorhis) and History of Washington County, Pennsylvania, with Biographical Sketches of many of its Pioneers and Prominent Men (Boyd Crumrine). The Sketch, however, has more details in its narrative than any other printed source material that I have read about Peter Hasselbacher/ Hazelbaker. This could suggest that Mr. Kinne knew someone in the Hazelbaker family and was told actual family accounts of what had happened to Peter. These accounts, very likely, would have been handed down from generation to generation. This is only an interesting viewpoint as no proof can be offered by this writer to substantiate this theory. I believe that each letter, sketch and list was typed individually due to the fact that they were typed between 1895 and 1898 and I would imagine that no copy machines were available at that time to make the task easier. 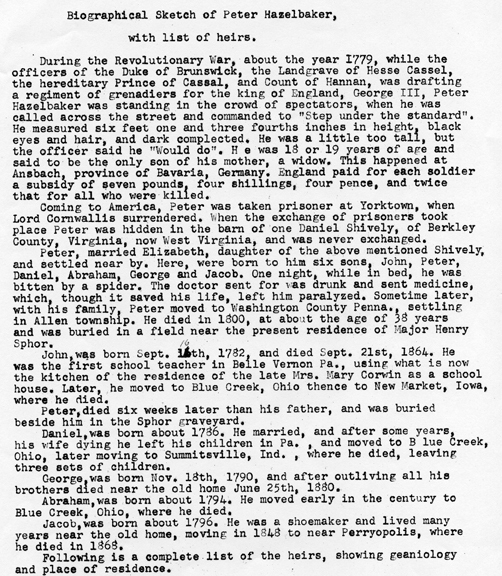 "During the Revolutionary War, about the year 1779, while the Officers of the Duke of Brunswick, the Landgrave of Hesse Cassal, The hereditary Prince of Cassal, and Count of Hannan, were drafting a regiment of grenadiers for the King of England, George III, Peter Hazelbaker was standing in the crowd of spectators, when he was called across the street and commanded to "step under the Standard". He measured six feet one and three fourths inches in height, black eyes and hair, and dark complected [sic]. He was a little too tall, but the officer said he "would do". He was 18 or 19 years of age and said to be the only son of his mother, a widow. This happened at Ansbach, Province of Bavaria, Germany. England paid for each soldier a subsidy of seven pounds, four shillings, four pence, and twice that for all who were killed. During the course of my investigation, I have come across information from several different sources, i.e., libraries, internet, family history records. On the website, www.americanrevolution.org there is a transcription of the book entitled THE HESSIANS and the other german auxiliaries of great britain in the revolutionary war, (Edward J. Lowell). Mr. Lowell states that over 29,000 auxiliary troops were sent to America. These troops were referred to as “auxiliary” not “mercenary” troops. Their number was greater than half of the total British contingent for the whole war, whose number has been placed at 56,000. (1) It seems that early on, the German princes were having problems filling their quotas required by the treaties they shared with the George III, King of England. [Recruitment] “Officers were, however, instructed to bring as many foreigners as possible into the service, in order to spare their own districts…”(2), meaning anyone that lived out of the recruiter’s own districts. Although forcible recruiting was forbidden, recruiting officers were not inhibited by this rule and recruited as many men as possible into the army. It would seem to me that a tall, young man such as Peter Hasselbacher/Hazelbaker might have been a feather in a recruiter’s hat. The information I have just offered in reference to forcible recruiting seems to support the family lore that indicated that Peter “was called across the street and commanded to step under the standard.” It would indicate to me that he probably did not volunteer, but rather, was just taken from the crowd and forced to join the Ansbach/Bayreuth Regiment of the Hessian Army as our family history states. Whether he agreed to it or not has not been established. The suggestion is that he did not agree and that suggestion is certainly plausible after examining the previous publications. As to the claim that Peter was considered too tall at 6’1-3/4” tall, I have been unable at this point, to find any information indicating the physical requirements for the new recruits of the Hessian Army. British Army recruiting requirements, however, indicate several different heights and ages, depending on how desperate the British Army or the recruiting officer was to reach his a quota. In several sources I have found, it has been stated that the British did require that new recruits be at least 5’4” in height,5 however, I have not uncovered any data indicating that they had a requirement that would disqualify a man if he were too tall. So in my personal opinion, I accept the claim that Peter was commanded to “step under the standard” however I do not accept the statement that he was told he was too tall, but would be accepted into service anyway. Peter Hasselbacher/Hazelbaker’s birth date has been proven by Hazelbaker/Hasselbacher genealogists Peter Hasselbacher the Younger (as he humorously calls himself when required for clarity) and also Imogene Sawvell Davis, a Hazelbaker descendant from Oklahoma. 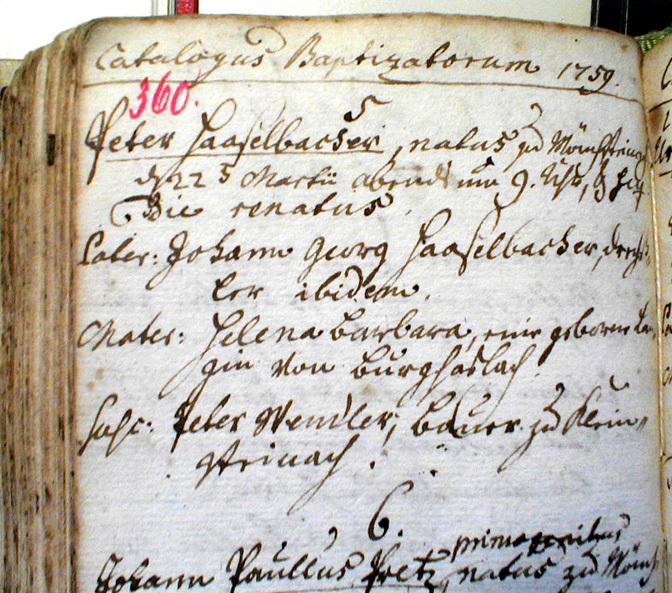 Both are extremely accomplished genealogists, have traveled to Germany, and acquired copies of the baptismal record of Peter at St. Nicholaus Church of Muenchsteinach, Bavaria, Germany. This record established Peter’s (the Elder) birth date as 22 March 1759, therefore in March of 1777, he would have been close to 18 years of age and a fine specimen to deliver to the British. The Sketch states that Peter Hasselbacher/Hazelbaker’s recruitment was about the year 1779, but the first and largest contingent of the Ansbach/Bayreuth forces was recruited in 1777, arriving in July of 1777 at Sandy Hook, New York. This group of men numbered over 1200 with other smaller contingents to follow, making the total for the Ansbach/Bayreuth troops over 2400 men (6). Information is given in the doctoral dissertation of Dr. Erhard Staedtler, entitled Die Ansbach-Bayreuther Truppen in Amerikanischen Unabhaengigkeitskreig, 1777-1783 (The Ansbach-Bayreuth Troops in the American Revolution, 1777-1783), that substantiates that Peter Hasselbacher/Hazelbaker would have come with that assemblage in July 1777. Staedtler gives names of commanding officers, and ships on which the troops were transported. He also gives a list of names, companies, commanding officers and in some cases the place of origin (birth) of many soldiers that were not repatriated in 1783. Peter Hasselbacher is on that list. His company was one that came with the early contingent in 1777. It is a matter of record that Peter Hasselbacher/Hazelbaker’s company served with Lord Cornwallis’ troops in their defeat at Yorktown on 19 October 1781 and those who survived were taken as a prisoners of war (POW) after the surrender of the British troops. The Hessian POW’s were marched to Winchester, Virginia to the New Frederick Barracks. Dohla continues on page 189 of his diary, “During this move we spent sixteen days and made a march inland of 240 Virginia miles.” The conditions in the New Frederick Barracks were appalling and there was not enough food to feed the prisoners. This caused much restlessness in the ranks of the prisoners and led to many being given passes to go into the countryside to work for local farmers. According to the information documented here, it is therefore reasonable to assume that family history is correct and that Peter Hasselbacher/Hazelbaker went to work on the Daniel Schaublin/Shively farm in Berkley Co., Virginia. Dohla’s timeline fits for Peter and his wife Elizabeth (Shively). December of 1781 would have been about the time that they got married and she would have become pregnant with their first son, John, who was born in September of 1782. Dohla’s account lends credibility to the family story about Peter and Elizabeth that has been handed down through the generations. A newspaper article from the Charleroi, Pennsylvania newspaper, “The Charleroi Mail”, dated May 29, 1957 (Fig. 6), entitled “Ella Hazelbaker, Kin Of Pioneers, Nears 89” presents an interview of Miss Ella Hazelbaker, a great-granddaughter of Peter Hazelbaker and provides a look at how family lore has been handed down through the Hazelbaker family. It does not prove, however, that the information came only from spoken family history accounts or whether it could have come, at least in part, from the biographical accounts by J.S. VanVoorhis, published in 1893, or Crumrine’s “History of Washington County” published in 1882, or even, perhaps the “Biographical Sketch” which was written between 1895 and 1898. 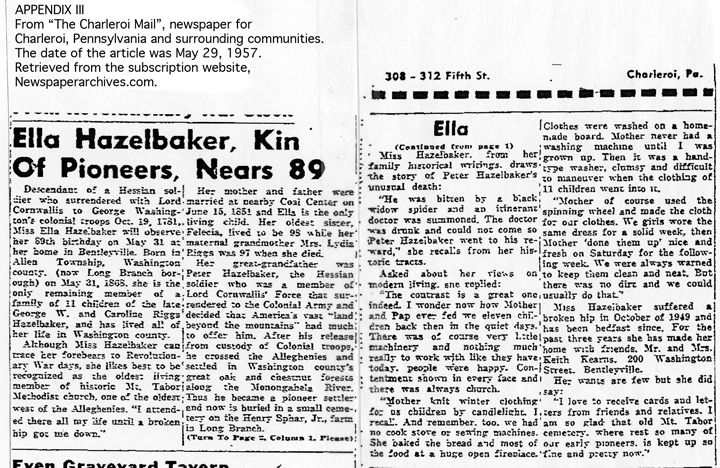 I believe that although the “Biographical Sketch of Peter Hazelbaker” and the newspaper article previously mentioned, do seem to have information that can be found in published accounts, they also contains details that probably came from family information that I believe, was spoken and not written. It is my conclusion that both documents contain mostly reliable information. In this pursuit of details that are often incorrectly recorded in legal documents, one must follow the clues, and use common sense and rely on the help of others to reach conclusions. Since I am unable to prove, or disprove many of the details of these documents, I have to arrive at my own conclusions based on the circumstantial information I have uncovered in my research. Please feel free to contact me, by phone, letter, or email to discuss this essay, and by all means, if you have contradicting information or are able to substantiate any of my assumptions, please let me know. First of all, my dad, Arnold Hazelbaker, who sparked my interest in Hazelbaker history many years ago. I do it all for him. Peter Hasselbacher, the Younger, who so unselfishly has invited me to write this essay for his website. His dedication is remarkable and his research has tied together two lines (German and American) of the Hasselbacher family. Caroline “Jo” Koenig, from Scioto Co., Ohio, who so graciously shared her manuscript with me many years ago and really helped to get me started. John “Jack” White, from Kamloops, British Columbia, Canada, whose wonderful narratives kept me up late at night reading about my Hazelbaker relatives. Imogene Sawvell Davis from Oklahoma, who, in my opinion, is one of the most accomplished Hazelbaker genealogists in the country.